Enjoy a full day of fun with your own chauffeur and executive black Sedan or SUV taking you from your hotel/residence in San Francisco to scenic horseback riding in North Sonoma County followed by a custom beer and wine tour experience of the Russian River. Your day starts with your assigned chauffeur arriving at your doorstep or hotel in San Francisco and whisking you away to Sonoma Valley to a private horseback riding experience second to none, with breathtaking views of wine country's valleys, creeks and vineyards. On the way to the horseback riding site, we are more than happy to stop off at the North point of the Golden Gate Bridge to take photographs of your group and the bridge! Then, your group is taken to up to a handful of Russian River's best wineries & breweries with great food! Once finishing wine tastings for the day, your group will be driven back to your hotel in San Francisco. Upon booking your tour, Cardinal Tour Concierge will reach out to your group and set up the details for the wine tour and horseback riding options. The details that concierge will go over with you consist of the following: Pick up time, preferred pick up location (if not your hotel or residence listed), picking your horseback trail, brewery & winery choices based on your groups preferences in wine type and venue. From your hotel in San Francisco, your driver will whisk you away and up North to Sonoma County, where your group will get to spend anywhere from 20 minutes to 90 minutes on horseback in Russian River Valley. Once being dropped off at the ranch, your group will be greeted by the ranch staff and operators, who will then take you through all preliminary safety briefings and tutorials before letting your group gets geared up and ready to ride. Your group will get to enjoy your pre-selected scenic trail of valleys lakes and mountains. Your driver will be awaiting your return at the end of the horseback riding. Upon text or phone call, your driver will be ready in just moments to great your group and present our company gift bottle of champagne to enjoy a toast in the Ranch lot before taking off to take your group's first winery stop: Francis Ford Coppola Estate. FFC estate is a gorgeous property in Geyserville etched into the green hills of the valley. You'll certainly notice the brilliant oxidized copper pointed roofs of the estate as you drive through the entrance. This winery offers multiple tasting rooms, as well as a restaurant with outdoor seating overlooking the valley and vineyard. 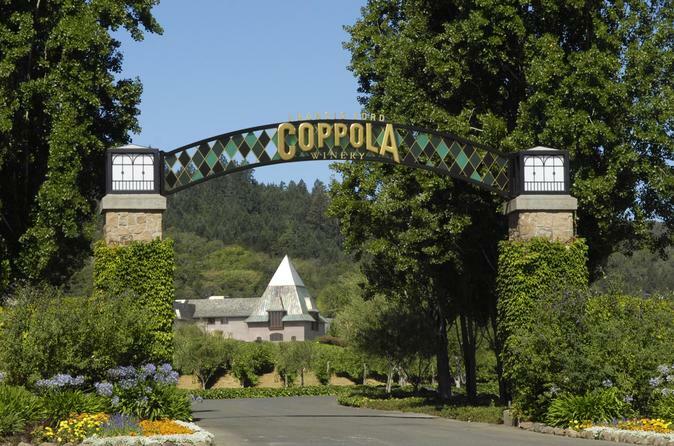 Dont forget to check out their museum of replica pieces from Coppola's famous movies! From Coppola, your driver will take you to Downtown Healdsburg to visit Bear Republic Brewery, where great brew and robust lunch menu await you. After finishing up at Bear Republic Brewery, your driver will take you down the street to one more winery, Geyser Peak. Geyser Peak Winery offers a quiet and intimate tasting, just outside of the busy downtown of Healdsburg. Once your group finishes their tasting, the driver will take you back to San Francisco.